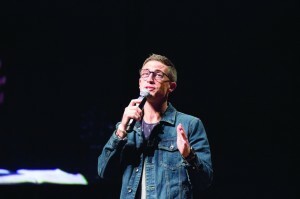 DAVIS—More than 2,200 people gathered at Falls Creek Baptist Conference Center Oct. 17-18 for the 2014 Fall Back Retreat. Many students used their fall break to attend this event and grow in their understanding of how God is equipping them for their future. The Falls Creek staff opened the amphitheater for students to use the skate park, ropes courses, ping pong and other activities. This is the fourth year for the Fall Back Retreat. After brainstorming ways to serve the churches of Oklahoma, Fall Break weekend seemed to be a great place to start. Bill Bergstrom, BGCO Conference Centers guest relations manager, puts together a team of youth ministers to help plan the event. This year’s team included Aaron Myers from Ada, Trinity; Garry McNeill from Durant, First; Brad Millsap from McAlester, First; and Holden McCrackin from Duncan, Immanuel. This team selects the speaker, worship leader and programming elements included in the weekend. This year’s retreat included services led by Ed Newton and worship led by the Doug Matlock band Friday night and Saturday. About 90 churches were represented during the weekend retreat. For new Ardmore, First Youth Minister Jake Anson, this was his first event with his students. 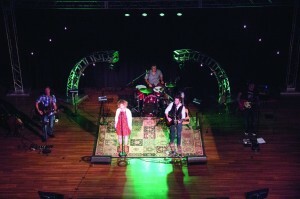 The Doug Matlock Band, featuring Doug and Courtney Matlock, led worship during the Fall Back Retreat. “This event really helped us become a more united ministry,” Anson said. “Ed Newton did an outstanding job teaching the Word of God. Newton always does well at engaging with students and student leaders. He provided a real challenge for our kids. God truly uses Ed Newton as a teacher—not only are my students a fan, but I know I am, too. Two students in Anson’s youth group gave their lives to Christ, one recognized the need to be baptized and three felt a call to missions. There was an invitation at every service, but the only time they recorded the decisions was Friday night. On Friday night there were 27 professions of faith and 10 other decisions recorded. On Saturday, the students responded to their youth leaders.